Godzilla has left Japan for Germany and conquered its class. Nissan ran several GT-Rs in the 24 Hours of Nurburgring race over the past weekend. Audi may have taken first and second place overall, yet it was the #123 GT-R that took home first place in the SP8T class. 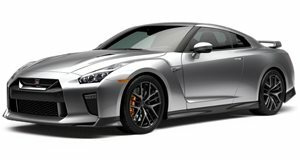 The #123 Nissan GT-R featured the Track Pack, a lighter and more race-oriented version of the standard Godzilla. It was piloted by amateur racer and Nissan GT Academy winner Lucas Ordonez along with Kazunori Yamauchi, Tobias Schulze and Yasukichi Yamamoto. It finished 30th overall and at the head of its class. Check out a video of the action below (as a side note, some of the interviews are done in Japanese). Ordonez said of the race that "It was a pleasure for me to drive with the guys from Japan. I have learnt a lot this weekend and I have a new respect for the GT-R and this amazing race track." Team Nissan GT-R also ran the #23 car in the race, although it had some mechanical issues. It finished 99th overall.